Having shiningly white teeth is a great feeling. When we first meet others, many of us have a tendency to notice a person’s teeth first. Unfortunately, sugary drinks and coffee can cause your teeth to become progressively yellower. This is why it’s very fortunate that many effective ways of restoring your teeth’s natural whiteness currently exist on the market. The best teeth whitening products will restore your smile and reverse the damage that can occur due to aging and diet, so let’s take a look at some considerations. Teeth whitening is currently experiencing something of a renaissance; currently, the tooth whitening industry is worth $11 billion per year. Such a popular hygiene option does have some considerations and there are also several different types of teeth whitening systems. This whitening method uses activated charcoal to scour and absorb materials from the surface of your teeth. Most people who use this method do it once per week and some use dedicated products to perform the whitening exercise. For the most part, those who use this method will mix a bit of activated charcoal (usually from a capsule) with a small amount of toothpaste. The toothpaste adds minty flavor to the charcoal mixture. First, your teeth will be blackened with these types of products while you brush. Secondly, these products also are not dentist recommended for tooth whitening; with many dentists feeling that using charcoal can actually damage your tooth enamel like in this report by Fox News. In any situation, we’ll be covering one such charcoal-based product in our review section. This style of whitening whitens teeth through a chemical system that directly reduces the presence of stains caused by food, drinks, or smoking. To use this whitening method, simply brush as you normally do. These whiteners tend to be a little chalkier than standard toothpaste and their effectiveness is often questioned. Still, this is a fairly easy system to try and increase the luminosity of your smile. As with charcoal whitening there is a warning: since these whiteners can also incorporate special abrasives that gently revitalize the teeth, enamel damage can happen over time. Strip whitening is one of the most common methods of tooth whitening on the market today. Typically, users simply place a ‘whitening strip’ on their teeth and leave it there for a certain amount of time. The strips adhere to your teeth and while it’s working, you can typically go on with your day. While it’s attached, enzymes and chemicals in the strip like hydrogen peroxide gradually remove staining and whiten your teeth. The biggest caveat with this type of whitening is that these can cost a lot of money. Simply put, you’ll have to spend more than $50 for most of these strip-based systems, but the upside is you won’t have to perform this process too often. This dental whitening kit can greatly increase the brightness of your teeth. For the most part, dentists recommend getting whitening trays that are fitted to your teeth by a dental professional, but there are still a lot of over-the-counter whitening trays that effectively bleach your teeth back to their natural pearly whiteness. At home trays simply require you to boil some water, place the tray in the water until it starts to visibly wilt, then place the softened tray in your mouth to form a tooth impression. Once this is done, you simply apply the whitening solution to the moulded tray when you want to whiten your teeth. This method is a unique style of teeth whitening that uses UV light and hydrogen peroxide. People who use this system must first place a mouthpiece into their mouth. This mouthpiece exposes your teeth so that you can apply a peroxide-based UV solution directly to the surface of your teeth. Next, you’ll have to use a UV projector unit that attaches to the mouthpiece. After about 10 minutes, the UV light will have done its work and you should see significant brightening in your teeth. This method is actually very effective and it has a major benefit of not using any abrasive materials that can damage the enamel on your teeth. The chief disadvantage of this method lies in the UV light. Similarly to the damage that can happen from absorbing too much UV light on the beach, applying this form of radiation onto your gums can cause burning issues as mentioned in this LiveScience article. Also, many users of this method state that this method causes excess tooth sensitivity. So now we know the methods of whitening your teeth. We can now take a look at some of the best products to whiten your teeth! 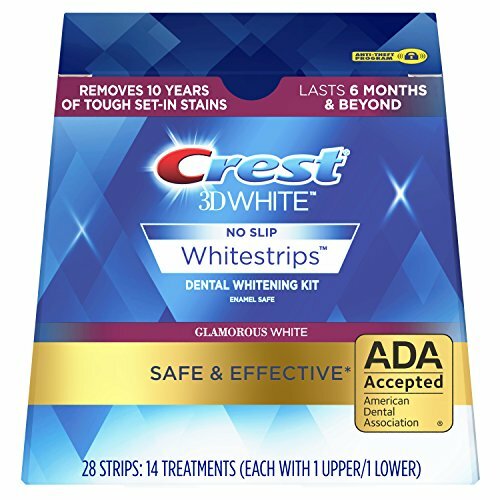 Crest 3D White Strips with Advanced Seal Technology is one of the more popular over-the-counter whitening solutions currently available on the market. This particular product really makes it obvious why this brand of whitening is currently the market leader. A major flaw with the white strip technology is that sometimes the binding agent that is used to adhere the strips to your teeth can feel a bit like gunk while the whitening process is happening. You’ll sometimes experience an overflow of the liquid that just feels uncomfortable. Fortunately, Crest must have figured out a better system because these strips stay on your teeth and the binding agent is very thin and properly measured. To apply these, you simply start with the bottom teeth first. Place the strip’s bottom near the base of the gum line and fold it over your teeth to complete the seal. Since this uses ‘advanced seal’ technology, these strips simply won’t move once they’ve fully been bound to your teeth. Because of this tech, you’ll be able to easily talk and drink water with these strips in your mouth, though you might have a pronounced lisp. Sometimes these types of products can leave a patchy whiteness on your teeth, which is very unattractive. These apply a very even level of whitening so that you can smile confidently. Unfortunately, there are some weak points with this product. Chief amongst these is the advanced seal technology. While this feature is excellent for keeping the product in place, it also has a drawback: these can be a pain to remove. When you remove them, you can also expect a fair bit of tooth sensitivity as well. As mentioned previously, the charcoal method of tooth whitening has been gaining ground insofar as popularity is concerned. 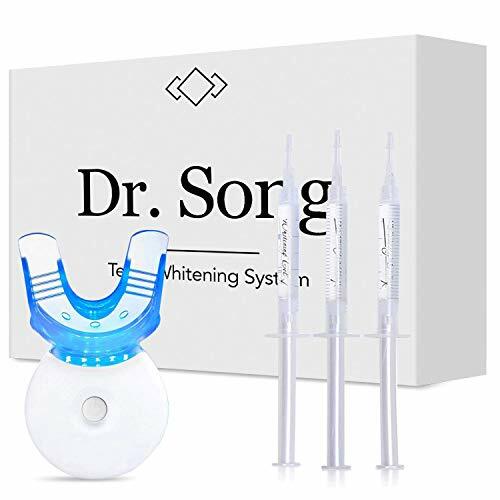 Dr. Song’s All Natural Charcoal Teeth Whitening system capitalizes on this new trend by providing an easier method of tooth whitening that is a little more pleasant than using activated charcoal capsules. The chief advantage to using this particular product is its inoffensive taste. Charcoal doesn’t taste great, even when you augment it with toothpaste. To counteract the foul flavor, Dr. Song’s used a coconut flavoring that takes the edge off significantly. You’ll definitely see results from this product, and significant whitening usually occurs after one usage, which you should repeat weekly. A slight drawback of this product is that it doesn’t include a safety seal, so if you’re ordering it online, it’s hard to know if it’s been tampered with. Also, it comes in a fairly small bottle, so while it may last you quite some time, you might find yourself needing to replenish your supply in a few months – dependent on your usage, of course. Finally, this product is a pure powder, so you’ll have to add water to it and dip your toothbrush in. Not only is the abrasive powder not the best for your enamel, but the black substance will definitely stain your toothbrush. We didn’t cover gel-based whitening solutions in the previous section, but these options are very similar to the peroxide-style options. For this type, you simply use a “pen” to apply the peroxide solution directly to your teeth for the whitening experience. 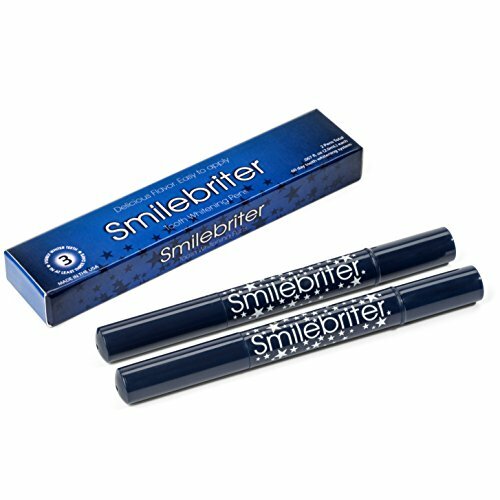 The Smilebriter Teeth Whitening Gel Pen is a fairly simple solution for those looking for a quick whitening experience. Each pack comes with two pens (one and a bonus pen), which will last for about 120 days. Unlike other products of its type, the Smilebriter Teeth Whitening Gel Pen takes a few days to yield a noticeable color difference. On the other hand, over time, there will be a very sizeable and noticeable difference if you stick to the regimen that’s recommended by the manufacturer. The active ingredient in this product is 44 percent carbamide peroxide that yields 14.6 percent hydrogen peroxide. This ingredient provides excellent whitening capabilities over time without much in the way of enamel-damaging abrasiveness. On the other hand, the four percent carbamide peroxide content of this solution can cause gum burns, so if you experience this reduce usage so that your gums will have time to heal. In addition to this, this whitener tastes like minty hydrogen peroxide; making it not the most pleasant whitener on the market. Our fourth product is another product in the Crest 3D White line of products. 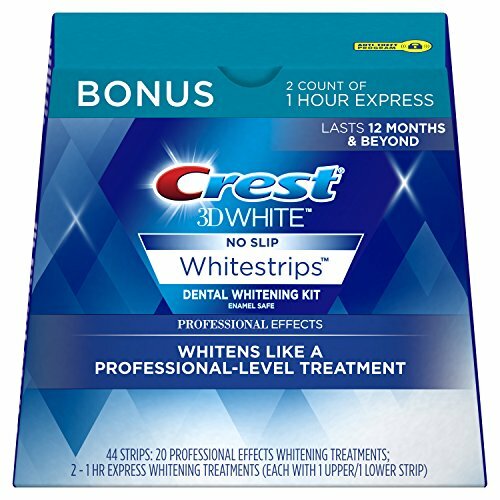 Similarly to the other product, the Crest 3D White Luxe Professional Effects utilizes advanced seal technology to adhere the strips safely to your teeth. Once attached, you’ll be able to eat and drink with these strips. Where this product differs is in its effectiveness. These strips are designed to remove 14 year’s worth of accumulated staining on your teeth in a single session. This degree of effectiveness is amazing and is one of the better products of its type. With one hour of whitening application, this product will provide quick results, which is perfect because you only get two treatments of the one hour express applicators. Outside of these strips, the package includes 20 Professional Effects strips that work well, but are effective over a larger timeframe. The one hour strips are perfect for when you need whitening, but don’t have any time to plan. Another great feature of this product is that it’s enamel-safe; as a matter of fact, the formulation is exactly the same as what dentists use to whiten teeth. One of the biggest drawbacks of this whitening system is its ability to make your teeth and gums extra sensitive. These strips can also cause some burning on your tongue, which will greatly affect how you taste food; at least for about an hour after you use the strips. 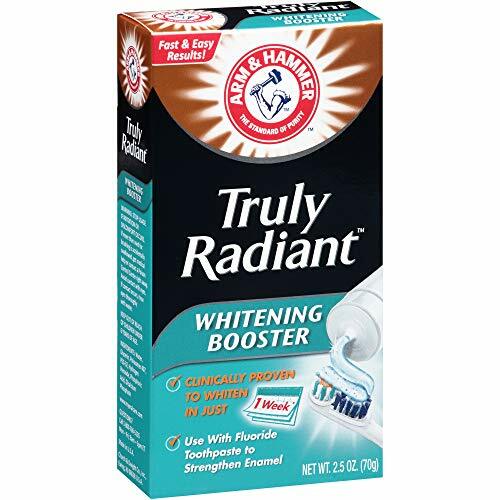 Our final product is the Arm & Hammer Whitening Booster, which is a toothpaste-based whitening solution. This product actually uses two times the whitening agent that’s found in many whitening strip solutions, and over time, you can expect a fairly thorough whitening experience with this particular product. If you’re looking for instant results, this isn’t the product for you, but if you have some time you can expect that that you’ll start to see the best results after about six weeks. Unlike standard whitening toothpastes, this product doesn’t really have a taste. This neutral flavoring, especially in toothpaste, can be off-putting to some, so you might have to adjust. As with many of the products produced by Arm & Hammer, this tooth whitener does have baking soda, which can be a bit abrasive to your teeth’s natural enamel. To counteract this, it’s recommended that you use this product with enamel-boosting fluoride toothpaste, which will also provide extra minty flavor to your brushing and whitening experience. Like many of the products on this list and in whitening in general, this product has a tendency to cause a bit of tooth sensitivity. It’s recommended that those who tend to experience this kind of pain that you don’t use this product every day if the pain is too intense. Our favorite product is the Crest 3D White Luxe Professional Effects. While it does present problems when it comes to sensitivity, its advanced seal has a great grip that you can use when eating. Also, the one hour express strips really make it easy to whiten noticeably, even on short notice. If you’re looking for a quick and easy whitening solution that won’t interfere with your daily life and won’t stain your toothbrush black, then this is a great product that might work for you. An informative article. Keep posting such articles.